DaimlerChrysler has finally introduced one of my most anticipated vehicles, the Grand Cherokee 3.0L turbo diesel. 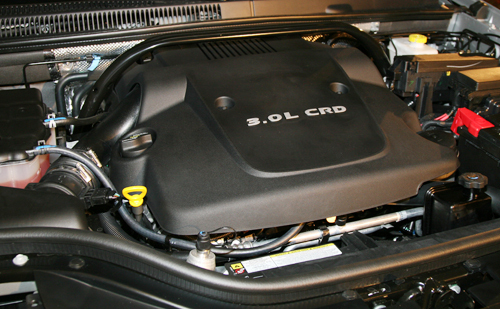 The engine for this application is none other than the 3.0L diesel motor found in the Mercedes ML Class. In the Grand Cherokee, power output is pegged at 215HP and 378 lb-ft of torque. Contrary to initial reports the engine used in the Jeep is not rated as a Bluetec unit. In speaking to the engineer present, the term Bluetec was explained as any system that meets emissions standards in all 50 US States, this power-plant is certified for use in 45 states. The move to meet the emissions standards of all 50 States will have to wait a couple more years until diesel fuel standards are cleaned up to allow fewer emissions. The main selling point of the package appears to be an “eat your cake and have it too” pitch. If diesel purchasers are seeking fuel economy at the expense of some utility or size Jeep figures the Grand Cherokee offers a decent compromise. Buyers will now have the choice of a mid-sized SUV with 4 wheel drive and fuel economy between 22 and 30 miles per gallon (according to figures supplied by DaimlerChrysler). 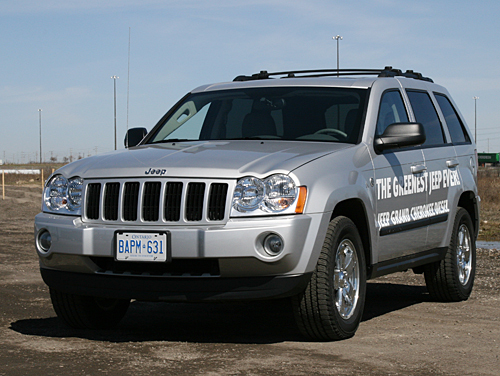 The 750 KM range of a diesel Grand Cherokee on the highway, is almost enough for a trip from Windsor to Montreal or 4 round trips from Barrie, Ontario to Toronto. With an expected 30% increase in fuel economy over a gas engine, the reported break even point for a buyer choosing the CRD Grand Cherokee over a regular 5.7L Hemi, is 2.5 years if driving 20,000 kms. Expect a quicker rate of return if drive more than that in a year. One of the most impressive features of the new diesel engine is its transparency. Upon ignition there is not diesel clatter from the engines, nor smell from the exhaust. Tromp on the gas pedal and instead of black smoke churning form the tailpipe, the engine unleashes gobs of power down onto the pavement. The refinement of this package will surprise both diesel doubters and supporters alike. Other things to note on the new Grand Cherokee CRD, towing capacity is pegged at 7,000 lbs, the use of a new particulate filter in the exhaust system requires no additional maintenance and due to the use of low ash oil and engine design, engine service intervals have been increased to 12,000 miles or 6,000 miles under harsh conditions, which is what the Canadian climate is considered, this is considerable better than the service expectation of a gas engine and will further reduce operating costs. Look for a sticker price of $46,000 for the Canada Only Laredo, and up to $59,000 for the top of the line model.